From stunning glazed Moroccan tiles, to subtle earth tones Mediterranean terra-cotta tiles; from a simple Moorish mosaic waterline, to a raised spa wall, your tile is a focal point of your poolscape. 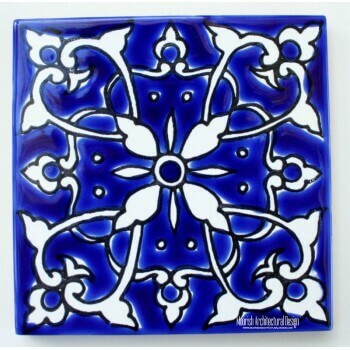 Our Pool Tile Collection will help you discover a pool tile that’s a reflection of your own personal style.Browse our website for the best quality decorative swimming pool tiles including Mediterranean pool tile, Spanish Talavera tile, Portuguese Tile, turkish Iznik tile and much more. Customize the look and feel of your pool with quality tiles and coping from Moorish Architectural Design Pool Tile. We manufacture a full range of luxury finishes to give your pool just the shimmer and texture you’re looking for. From modern Moroccan tile and durable ceramic to hand painted accent tile and coping. Our pool Tiles are are from the highest quality and complement any pool style or design theme. Choose from an endless array of texture and color combinations to create a luxury Moorish Style pool interior that’s uniquely you. Moorish Architectural Design offers great selection of hand painted Mediterranean, Spanish, Portuguese, and Persian pool tiles suitable for swimming pool waterline. We carry huge selection of exotic artisan tiles that add an air of luxury to any pool design and can help give your backyard a resort-like feel. Moroccan mosaics have become an increasingly popular choice for pool liners. The natural glaze of Moroccan tiles captures and reflects natural light, offering an iridescent quality that enhances the beauty of your swimming pool. 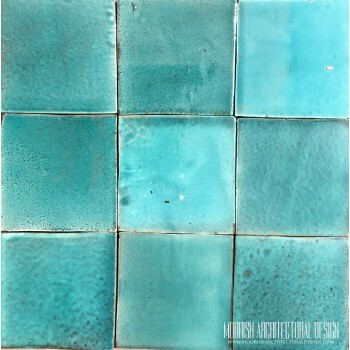 Due to their popularity and high demand, there are now a great amount of handmade artisan mosaics available that can be used as swimming pool waterline tile. For instance, consider going with Spanish Mediterranean pool tiles which is a stylish line that's designed with a finish specifically tailored for use in pools and spas, where outdoor elements can take a toll. If you'd like your pool design to mesh well with your contemporary home, choose a material that's edgy and unexpected for your pool lining. For instance, the glazed Moroccan tiles line offers a modern, linear mosaic tile that's available in sleek colors and will elevate the look of any contemporary swimming pool design. This durable hand glazed clay tiles option is well-suited for pools and other exterior applications including Moorish fountains, outdoor kitchens, stairs, pool deck, and much more. When choosing waterline pool tile, give careful consideration to this small but important element in your overall design. A quality liner will add sparkle to the water and enhance your backyard atmosphere. Browse our Moorish pool deck tiles catalog for the best selection of original Moorish tiles suitable for swimming pool deck. When considering pool deck tile, remember that a beautiful swimming pool is more than just a place to splash away the summer heat. It should also serve as a relaxing oasis that gives you space to soak up the rays, relax by the water, and enjoy friendly conversation. You can create the perfect spot for these activities by putting thought into the design of the surrounding pool deck area. Adding the right type of pool tile to the space will enhance the beauty and enjoyment of your backyard, and will create a leisurely gathering place. 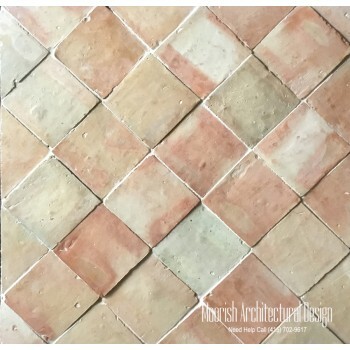 Moorish Architectural Design offers great selection of handmade, artisan, and exotic pool deck tiles including Spanish Mediterranean terracotta tiles, Moroccan encaustic cement tiles, glazed Moroccan ceramic tiles, and unglazed clay tiles. If you're a homeowner with a swimming pool, you probably spend just as much time on your deck as you do in the water. If your space needs an update, you'll need to choose materials that can hold up to moisture and wear and tear. The right pool tile can make the experience even more enjoyable as you relax poolside with a drink in hand with the sounds of summer filling your ears. Browse our website for the best selection of Moroccan pool deck tiles available in several colors, shades, and sizes. Many pool tiles tend to be a shade of blue, which evokes a calm, clear sense of the ocean. However, if you want to go in a different direction and expand your color scheme, it's now easier than ever to select a tile liner in a color that will brighten your summer days and nights. With the glazed Moroccan tiles line, you can choose from more than 15 different shades and multicolored mosaic patterns to create a unique look around the waterline of your swimming pool. Glazed Moroccan tiles also offer an extensive color palette, from subdued neutrals to bright, bold hues. This line will immediately add character and a pop of color to your backyard. Moroccan pool tiles design ideas to create a Moorish style swimming pool or Moroccan pool using handcrafted tiles from Morocco.